St. Mary’s, the oldest Catholic Church in Rock Island County, celebrated its 150th Anniversary in 2001. Founded in 1851 by Rev. George Alleman, it was initially known as St. James, but the name was changed to St. Mary’s about 24 years later. The current church building was constructed in 1862, replacing the small stone church originally built on the site. Stones from the destroyed Mormon Temple in Nauvoo were incorporated into the 1862 construction. A book produced for the church centennial offers more information. It describes the school as “two story brick, of modern design, and built in accordance with the requirements of the parish.” A large number of people from Davenport and Moline as well as Rock Island participated in its dedication. Those from Davenport were met at the ferry by the Rock Islanders, and the entourage, headed by Bleuer’s band, proceeded back to the church for services. After the blessing of the new school, there was a gathering in Columbia Hall on its second floor. The hall that was designed for school programs was said to have a “commodious” stage. For years, St. Mary’s was known as the German church and conducted many services in German. Other Catholic churches in Rock Island had different ethnic identities, notably Belgian and Irish. Such specialization of congregations was apparent in other denominations as well. This ethnic self-segregation likely resulted from the large influx of immigrants who did not speak English well and who sought the comfort of their native language in their spiritual life. Today’s postcard is captioned “St. 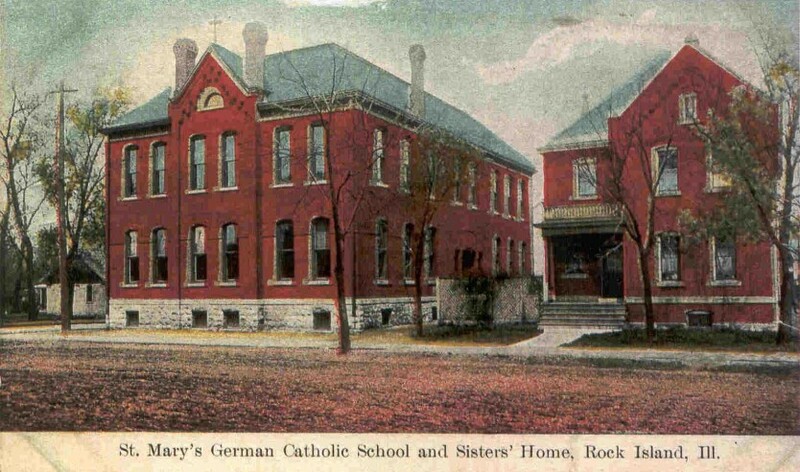 Mary’s German Catholic School and Sisters’ Home.” It shows both the school and the building that was home to the Franciscan teachers. Since the Sisters Home or convent wasn’t built till after 1900, we can date this postcard to after that time. The postcard shows both the school and home in red brick, with the gable detail in the home matching that in the school. The school also has an exposed rough stone foundation. Except for the addition of cast stone siding on the school and the removal of unneeded chimneys, the school has changed very little. The new siding still shows the gable details and the stone foundation is the same as always. The second story windows even have the original carving above each upper sash. Although the school closed in 1968, the building continued in use to serve the educational and social needs of the church. The school is now called Schroeder Hall in honor of Rev. George Schroeder, who retired in 1992 after serving 50 years in the priesthood, most of those years at St. Mary’s. When the school closed, the convent was unused and, after being vacant for some time, was finally demolished. NOTE: Shortly after this article was published in 2001, the roof of the school collapsed, causing tremendous damage as the sprinklers were set off. The congregation chose to rebuild the roof and repair the school building, so that it looks the same today. For this effort, they received an award from the Rock Island Preservation Society. This article by Diane Oestreich is slightly modified from the original, which appeared in the Rock Island Argus and Moline Dispatch on September 2, 2001.